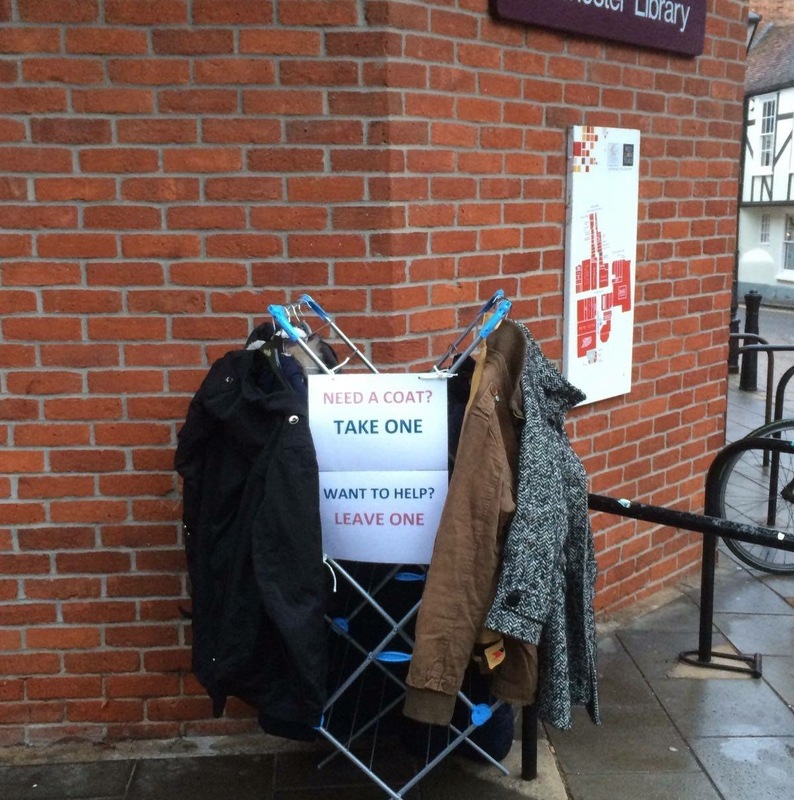 The other day a clothes airer with a handful of coats on it appeared outside Colchester’s public library and the GO4 Market Cafe. It was the start of a simple coat exchange initiative to help those in need. Before long it was being featured in media outlets including Colchester’s Daily Gazette newspaper, The Independent, the BBC website, and even across the pond on America’s ABC News. 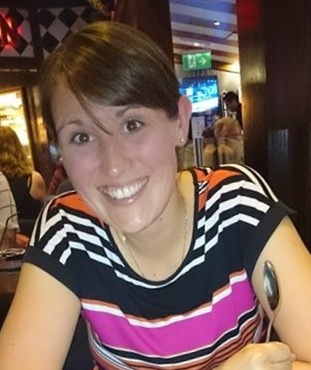 Fay Sibley, the Colchester resident behind the initiative, tells us all about it. A little over two weeks ago, as I embarked upon my train commute home from London, I sat idly scrolling through Facebook, pushing my thumb upwards, passing post after post. Suddenly something grabbed my attention, Spotted in Yorkshire had posted a photo of a coat rail with a few coats outside a shop and a sign that read ‘Need a coat? Take one. Want to help? Leave one.’ I shared the post – thinking this is fab! A few likes and a couple of smiley faces later a friend got in contact saying she too thought the post I had shared was fab. We both agreed – this simple act of kindness was something we needed in our hometown of Colchester. We discussed the pros and cons of various locations including the Salvation Army and the town hall, deciding that the Salvation Army was too far out of town and the town hall too exposed. Eventually we settled upon the Library behind Holy Trinity Church knowing that GO4 Market Café was based there and already ran several initiatives for the homeless – including a ‘pay it forward’ breakfast scheme. Galvanised and enthusiastic I told my friend I was just going to do it – I wasn’t going to ask for any specific permissions and if it was taken away ‘oh well what did it matter’. I did, however, contact Will Quince and advised him of what I was going to do, asking him to share it on social media once I had. My friend and I, along with our families gathered up our old coats. Unable to find a clothes rail at such short notice I grabbed my clothes airer, some string and my freshly laminated sign and on Saturday morning at 07.30 I headed to town. After I had hung the coats and tied on the sign I took a picture and shared it on my Facebook and twitter page – imploring others to do the same. The response was overwhelming, my post was shared over 900 times and I had never had so many twitter notifications in my life. 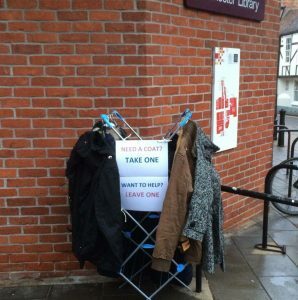 Within an hour of sharing the photo a local woman got in touch to tell me she had a clothes rail, a short while later she had dropped it to the exchange and added some coats. Others started to get in touch saying they too would donate coats – sending messages of support and encouragement. We started with 12 coats Saturday morning, and by the evening had more than 30! I think the success of the coat exchange exists in its simplicity – nearly all of us have an old coat or two at home that we no longer need or want. What the rail does is gives people an opportunity to put that coat to good use. It’s a simple gesture of kindness – which can mean so much to someone else. We have deliberately tried to keep the rules simple – anyone needing a coat is welcome to take one, whatever the reason for that need might be. I have met some wonderful people whilst I have been standing at the rail, some donating and others receiving, all touched by act of kindness that lies behind the rail. 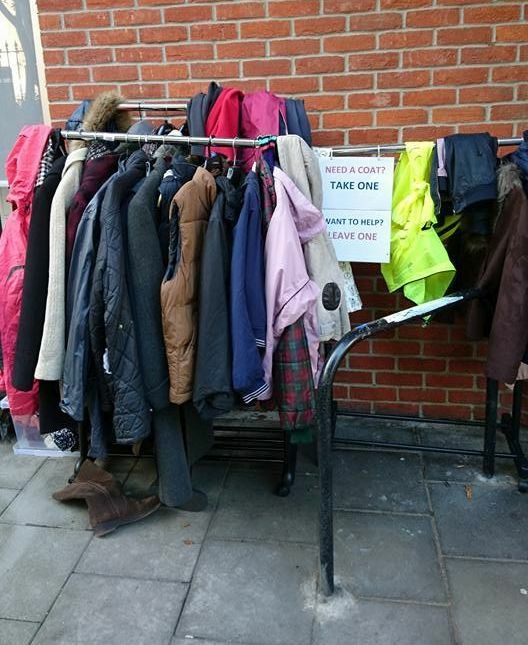 If you have a coat or two you would like to leave you can find the rail outside the library Monday – Saturday. The rail is only taken in on a Saturday evening, it is brought back out Monday morning.